D-5682, Purple Color, Shimmery Finish Paper, Laser Cut Cards, Hindu Cards, Exclusive Invitations. Photo Frame Look card. Front center part is laser cut with Ganeshji in gold. 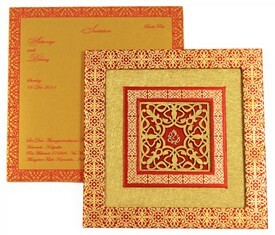 Intricate border design on inserts with center part in solid colors as Blue, Orange and Red.Multicolor Barat overly on inside. Lining is printed with same pattern but in gloss finish. Pocket in laser cut. Silk satin cloth for card with used a silken golden fabric on front. 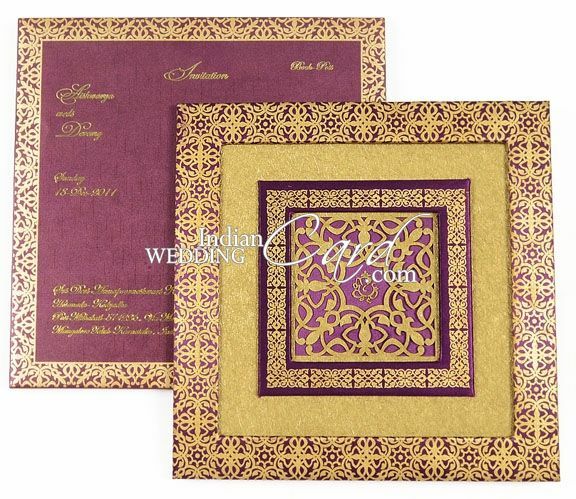 Inside Lining, pocket, double pasted inserts (3) and box envelope in purple paper (235gsm). Translucent paper overlay on inside.